The scanning and posting is the work of an Irish friend of mine, Pádraig Ó Méalóid, who is a scholar and a gentleman and a lucky bugger to have found it as well. would you be interested at all in taking a crack at it now? :) seems a shame that it never reached fruition, so many people left hanging, moore included. wasn't the whole thing plotted out already on a mandelbrot set grid or something? Jody, please tell your friend that I love him more than I can say. I think I'll reread 1 & 2 prior to checking out 3 though. For some reason issue 3 seems to have a Bojeffries feel I didn't get from the first two, way back when. Always nice to see our beloved Bradlaugh statue in the arts, caught there on one of the rare occasions when it's content to stand still on its plinth and not go wandering around the town pointing at curiosities. 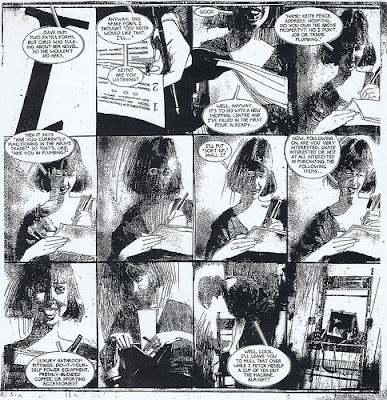 Now I'm speculating on what would have happened if you and Sienkiewicz had swapped books. A Campbellised Big Numbers I can visualise, but a sunken From Hell refuses to take form, despite the two projects' griddish similarities. Gull Catchers I could see working, I suppose. Two new pages in The Alec Omnibus? Do you have any idea how many copies I now have of the early Alec strips? And now I will get another set. What a good job that I so enjoy them. Yes, the Gathercole pages encapsulates just how brilliant both Alan is as a writer, and Bill is as an artist. It really breaks my heart that this project was never finished. Still, I'm glad we're given the opportunity to read #3 in its entirety at last. There are 45 pages of never before printed material in the omnibus. Bill, thanks for the insight. I can imagine how Kevin would have thought that way, with his leanings toward the slick Heavy Metal thing. I think it's quite beautiful how Bill was taking the style away from the photo-real where it started to a more spontaneous, cartoony mode. Dave Mckean was wrestling with the same problems in Cages and coming up with completely different solutions. I had seen a few pages from an issue of The Comics Journal back in 1998 or 1999. That was a cruel tease and the line going then was the same as what was previously posted- why bother publishing no. 3 if there wasn't any more to come. I agree that it was a horrible decision, surely there's demand for it and here we are looking at the bootleg anyway. From what I had heard, most or all of the series was written already, leaving whatever period touches that reside in the script already complete. The only person that would have to "go back" would be the artist tackling it. I haven't seen anything from #4. Surely it survives in some form?! Thanks for posting the images! Another thing I remembered, and I don't think I ever mentioned it to Alan, but I always felt a certain resentment that Billy the Sink got Big Numbers and blew it while i was stuck drawing Jack the bloody Ripper for ten years (I once described it as a penny dreadful that costs thirty five bucks). .. are you mad? FROM HELL is one of the very few graphic stories that deserve the name NOVEL in it, and it's the one book that I recommend to people who have heard about that "whole comics thing" and want to try reading something. As a work of art, I'd rank it higher and much more accessible than WATCHMEN, because it doesn't require even a most fleeting knowledge of "costumed hero mythology". And your artwork is indeed half of its artistic merit, since it is more in line with older illustration work. People can immediately understand it, follow it, even if they have never read something in graphic format before. And while I am sad that BIG NUMBERS was never finished (poke Alan! poke him! ), I am immensely glad that you and him made FROM HELL into something that just isn't a penny dreadful (the movie was, though) but a fully formed novel that is one of the few books I re-read and find new things in, both in art and writing, every time I do. Thanks very much for the kind words, Eddie. (And that goes for Jody as well!) I really still can't believe that I managed to find this, and *really* can't believe I was the only bidder for it on eBay. I fully expected it to end up in a private collection, never to be seen again. I've been putting up some of the odd bits and pieces of Moore stuff I have for a while, so I was really glad to get this, and be able to share it, once I checked it with Alan. And while I have you: I've been doing a series of interviews on the Forbidden Planet blog [ http://forbiddenplanet.co.uk/blog/?cat=30 ] and I was hoping I could do onew with you at some stage? In Kevin's defense, I have to say that the multi-generation photocopies don't accurately represent the startlingly abrupt transition between the wash pages and the duoshade pages. The copies are so corrupted that a casual peruser might not notice a difference. Cages was an integration of disparate styles, Big Numbers was an unannounced transition from a more work-intensive style to a less work-intensive one. And while I think the duoshade pages are well-done, I can certainly sympathize with the viewpoint that it undercuts the project as a whole, and interferes with the whole "color slowly seeping in, until the finale is full color" aspect. Consider me in line to buy the Campbell-illustrated version, by the way. Maybe it would help to convince Mr. Moore if you reminded him that you do have a successful track record with his "period pieces". Thanks, Thomas, Bill, Derek etc..
Padraig, you do good interviews, and I'd certainly be happy to be in line for one. I looked for an email add. at your assorted venues but can't see one. I remember seeing Bill having pages from Big Numbers #3 for sale in San Diego 4 or 5 years ago. Only around $200 a page but stupidly I never picked any up. Wish I had of course. None of them were duotone though, they were painted like the first two issues. Thanks, Sean. Long time no see. by the way. Help me complete my picture of events. what was your connection to Tundra? Were you working there, or where you in the office pitching a project? I was there working out the details of the schedule and contract for a project that was in production. My collaborator and I spent the day at the offices, during which Kevin showed us the original pages for #3. 45 pages? Excellent! And just who are you calling 'old'?